Meet Speed & Function at DrupalEurope! 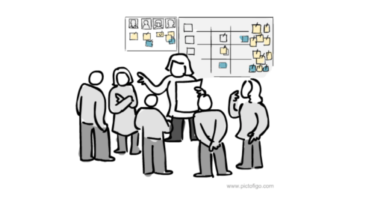 The retrospective meeting is one of the most important scrum events. A team can understand their strengths and weaknesses, discuss their relationships between each other, and set goals for improvement beginning with the next sprint. You can find tons of different information on how to conduct retrospective meeting: who should participate, what’s the order of discussions, what to do with conclusions made during the meeting, etc. But the event itself can remain uninformative and boring if not done well. So I’d like to share 5 ways to spend this couple of hours with your team. These activities and others can be found on a great site called Fun Retrospectives and can easily be mixed with each other within one meeting. It’ll make the retrospective more interesting and more productive. So let’s get started! Sometimes during the meeting a team sets unclear massive goals they simply don’t understand how to reach. The main purpose of this retrospective activity is to make a team think of things that they can easily improve fast and without significant efforts, so called ‘quick wins’. Conducting this activity, your team will be able to improve themselves by short, but steady steps. Describe so called 100 things by 1% improvement idea to your team, explaining the main benefit of using it and encourage them to think of small improvements. Ask each team member to think of the first ‘quick win’ things that came to their mind. Ask them to write their ideas down on separate cards. Gather all cards and discuss them with the team. Determine which quick wins can be done within the next sprint and discuss them with the team. That’s it, we’re done! My experience with this activity is that it is really easy to explain. I literally spent a couple of minutes describing it to my team on one of my projects. Then we just started brainstorming for several minutes, creating different cards and around 15 minutes discussing them. Spending just 15 minutes on this activity, we found several pretty annoying holes in the workflow that were eating a lot of our time and nerves. We created several tasks, added them to the next sprint and after we had done them, we realized how we had sped up the process. I’d definitely recommend every Scrum Master try this activity. The 360 degrees appreciation is a pretty simple activity. The main idea is to gather positive feedback for each team member to increase team morale and improve relationships between team members. Give paper and pen to each team member. Ask participants to write down what he/she appreciates about each other participant (but don’t make it last too long; 2 minutes per each participant is okay). When the team is done, ask them to form to a circle. Ask one participant to stand in the center of this circle. Each team member in the circle should read his/her appreciation card to the participant in the center (complete the 360 degrees). Change the participant in the center of circle until everyone has received feedback. 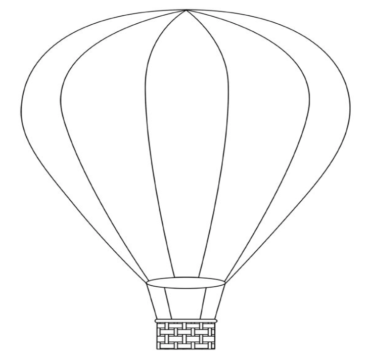 Hot Air Balloon is an easy and demonstrative activity that helps a team to realize what makes them move faster and what really slows them down. Ask the team to think of things that, in their opinion, slow them down or speed up the development process. Ask them to write their thoughts on cards. Cards that slow you down should be placed at the gondola, just like weights. As the previous ones, this activity is really easy to try and doesn’t require any specific skillset. But as a result, you can find out those ‘weights’ that really slow down your team. Are they getting pleasure or feel pain for doing what’s described in a card? How much gain or loss the project gets from what’s described in a card? Ask them to place cards on the graph according to how they feel about it. 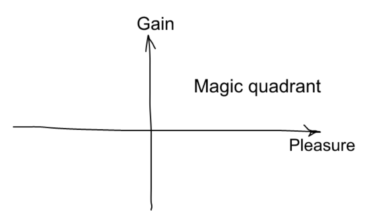 Discuss with the team what could be done so that each item would move towards the magic quadrant. We had a great time discussing the magic quadrant items. Everyone loves them! We also defined those activities that hadn’t brought neither gain nor pleasure to the project. We also discussed those items that bring gain to the project, but are not pleasant enough and defined how we could make them more pleasant. At the end, we got rid of items we love but that didn’t bring any benefit to the development process. 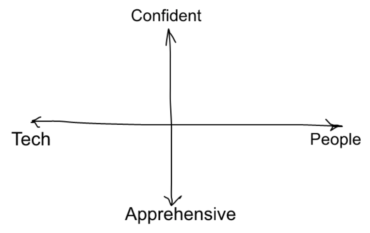 The main idea is to understand the team’s confidence on different aspects of the development process. Draw the graph on a board. Ask the team to put their cards on the graph. We haven’t tried this activity yet, so if any of the readers already have had experience with this, add a comment on how it went. I’m really curious on this one.